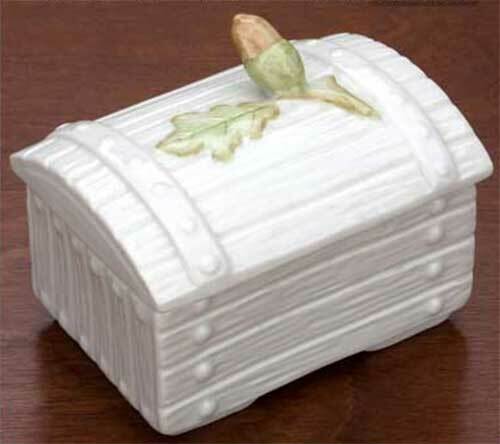 Belleek box features fine Irish china that is enhanced with an acorn and oak leaf design. This Belleek box is part of the 2010 Archive Collection and it is limited to 900 pieces. This Belleek box features a hand painted acorn and oak leaf on the lid. The Belleek acorn box is made of fine china and measures 3 1/2" wide x 2 3/4 tall. The acorn box is suitable for trinkets and jewelry. This Irish jewelry box is hand crafted in Belleek, Ireland and is gift boxed, complements of The Irish Gift House. Belleek jewelry box features fine Irish china that is enhanced with hand painted shamrocks and flax flowers. Belleek jewelry box features fine Irish china that is enhanced with hand painted shamrocks along with a Celtic motif. Belleek box features fine china that is enhanced with the Irish blessing along with hand painted shamrocks. Belleek box features fine Irish china that is enhanced with hand painted shamrocks.